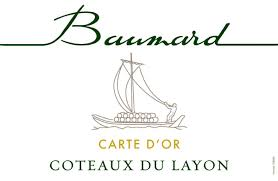 Baumard is one of my go-to producers in the Loire valley. I'm a fan of their whole line, from their full, dry Savennières to their luscious Quarts de Chaumes. The Carte d'Or comes from the region of Coteaux du Layon within Anjou, across the Loire river from Savennières. The wines are made from some combination of very ripe grapes (lots of sugar), grapes affected by noble rot (which concentrate the sugars), or grapes dried on the vines (which also concentrates the sugars). As you might then expect, wines of the Coteaux du Layon are all sweet (vinified to leave some residual sugar), varying from semi-sweet to intensely sweet. Review: The Carte d'Or has a deep golden color and gorgeous aromas of white peach, apricot, honeysuckle, and preserved lemon. It is medium sweet with bright acid, creating a full bodied wine, redolent of stone fruit, minerals, and waxy honeycomb. The finish lingers with flavors of honeyed peaches. Food Pairing: The sweetness and acidity of this wine make it so versatile. I paired with a spicy pork chili -- the wine was not only able to stand up to the heat, but the sweetness provided an excellent counterpoint to the spice. Perfection. Bottom Line: Bright, balanced, and delicious. (And a great price, right under $20).